One of the questions that has always been interested me in is how the process of “decision making” work. Us, humans, don’t act randomly and our decisions are based on a thought process inside our brains. What if a computer were to make a decision to get a certain result? There are algorithms that evolve autonomously, called evolutionary algorithms. The Genetic Algorithm (GA), is an example of them, that that evolves itself. The algorithm finds solutions to optimization and search problems. This evolutionary algorithm is used in large search spaces and inspired by natural selection. It is basically a trial and error process in which “the best” strategy” wins. Training a computer to win the “rock-scissors-paper” games against human players who play non-randomly. 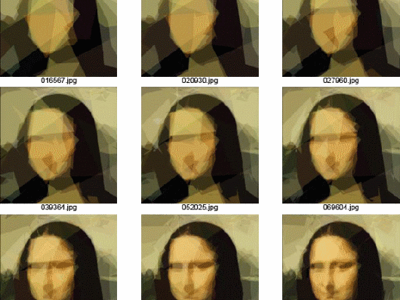 Image reconstruction from shapes or figures. This entry was posted in Science on September 23, 2014 by naghmeh. Future of Sequencing and Data Storage.